Imagine you have a policy so unpopular that even you don't vote in favor of it. For the time first time ever, not a single country voted in favor of the U.S. embargo against Cuba at the United States. Not the U.S., not Israel, which were the two countries last year that voted against the anti-embargo resolution. This year the vote was 191-0 with the U.S. and Israel abstaining. This is, then, the U.S. Congress against the entire world. Maybe that's a distinction that they enjoy. At this point, the embargo is hanging on only because the Helms-Burton law specified that Congress had to decide whether it would be lifted. The president cannot do so unilaterally. I assume Donald Trump will tweet about this at some point, since he just recently tweeted about visiting veterans of the Bay of Pigs. Criticizing the Obama administration for the abstention will garner him somewhere around zero votes (because the most intensely anti-Castro voters long ago decided not to vote for Hillary Clinton) but it's still fodder. As is so often the case in Latin America, the Venezuelan political crisis has brought in the military. Already the government had militarized a lot of functions, and now it has trotted out the leadership to warn the opposition and signal that the military leadership was on the government's side. Francisco Toro argues that Defense Minister Vladimir Padrino López's speech may well also have been signalling that the armed forces were not tied to any political faction and therefore (perhaps) would remain neutral. Significantly, he reads out the constitution’s Article 328, which establishes the Armed Forces as apolitical and in the service of the nation rather than any political partiality. This is one of those “inconvenient articles” chavista propaganda has banished from the public sphere, so to hear a Defense Minister cite it is highly significant. But then Padrino López goes on to argue that the Commander in Chief is not “a political partiality.” He closed the whole thing with a ¡Chávez vive!, but his speech steered clear of the kind of highly divisive language that’s the hallmark of chavismo. Either way, the military is getting sucked in whether it wants to or not. It has already been in the business of making arrests. A question I always have, especially given Hugo Chávez's origins, is whether there are ideological gaps between the leadership and the rank-and-file. The latter don't have the political and economic access of their superiors and are more connected the hunger and shortages on the ground. It is depressing that years after we spent so much time studying "consolidation" of democracy and what that meant, we're back to reading the military tea leaves. Update: go check out this analysis of the Venezuelan military by Brian Fonseca, John Polga-Hecimovich, and Harold Trinkunas. Basically, it's complicated. But we also just don't know what these junior officers are saying to each other in private. In Episode 8 of the podcast, I talk to Ali Stoyan, Assistant Professor of Political Science at Kansas State University, about her work on how executive with ambitious reform agendas sometimes use constituent assemblies. We talk about Bolivia, Ecuador, and Venezuela, with a dash of Honduras. What long-term political effects do they have? Listen to find out. I heard this on NPR: Justin Wolfers and Eric Zitzewitz have a paper showing how markets respond positively during the first presidential debate when Donald Trump seemed to be doing poorly. What jumped out at me is that the Mexican peso rose during that time. [T]he Mexican Peso rose sharply during our event window, and indeed, it rose more dramatically than any other currency. In light of Mr. Trump’s threats to restrict both trade and immigration from (and thus, indirectly, remittances to) Mexico, this also suggests that the markets were responding to election-related news. A Trump victory, then, is not just bad for U.S.-Mexican relations. Markets would also respond negatively, which would make things worse. Extrapolating, this suggests that the Peso would be worth nearly 30 percent more under a Clinton presidency, and the Canadian dollar would be worth 10 percent more. So the stakes for Mexico are extremely high. It is unfortunate, then, that Mexican President Enrique Peña Nieto is such a bumbler. Now he says that visit could have gone better. Ya think? NPR has a story on Cubans trying to get to the U.S., fearing (reasonably) that immigration policy may soon change. However, it's a misleading story. The headline is "Improved U.S.-Cuba Relations Are Creating a Surge of Cuban Migrants." This confuses proximal and distal causes. The proximate cause is the shift in U.S. policy, but the underlying problem is not Obama's policy shift, but the dysfunctional Cuban Adjustment Act of 1966, which undergirds U.S. immigration policy. I think it's hard to argue that set foot/dry foot (which is a 1995 amendment to the law) functions well. This is a straw man. No one thought there would be rapid change in Cuba, or claimed it would happen. Economically, the embargo blocks a lot of change, and even the changes happening now (flights, that sort of thing) take a long time to develop. The logic of opening up to Cuba was not based on the notion that Cuba would suddenly change. Instead, it focused on how current policy was completely ineffective no matter how you looked at it. So basically Obama is blamed for how any effort to change U.S. policy runs up against a crappy law passed 50 years ago. The answer is better immigration policy. Sadly, this is a bad time to expect it. He is scheduled to visit the 2506 Assault Brigade museum and library on Tuesday, the Miami Herald reported. The Brigade, veterans of the Bay of Pigs invasion, emailed its members over the weekend to inform them that "we were contacted by his campaign to coordinate a visit...to discuss the Cuba issue," the Herald reported. What demographic is he going for here? The very old Cuban American vote? This strategy goes directly against all logic. The Cuban American vote is increasingly young, diverse, and distant from the Cuban revolution. The Bay of Pigs is relevant for only a tiny minority. Recent polls show Trump splitting or only narrowly defeating Clinton among Florida and Miami-Dade County Cuban Americans, a sign that he has been unable to shore up support like his Republican predecessors have. Cuban Americans make up more than 70 percent of Miami-Dade's registered Republicans. Not sure how the Bay of Pigs is going to bridge that gap. Patrick Iber has a piece in Inside Higher Ed about the benefits of academics using Twitter. I've blogged about this quite a bit, but had not thought of how, as he quotes Princeton historian Kevin Kruse, that it is like having "global office hours." I love that notion because it's accurate. I talk all the time to people from all over the world about Latin American issues. He has some good suggestions. I disagree a bit about all the things he says you should not do (years ago I wrote a post saying the main rule of academic blogging was not to follow any rules). Twitter is mostly anarchic, which is one reason it's so fun, so my advice is to be yourself. If you're a jerk, Twitter will eat you up, and you will deserve it. Mike Allison writes that if you're a jerk, you won't enjoy it anyway, which is true. Finally he says it's important not to be on Twitter all the time. I've actually never tested that rule. My podcast Understanding Latin American Politics is now accessible on Google Play in addition to iTunes. Just click here. The Venezuelan government announced the end of the recall campaign and prohibited major opposition leaders from leaving the country. This comes on top of postponing the December state elections. That came on top of stripping the legislature of any power. So there is no democracy in Venezuela. Your past votes are being ignored and your future votes are being denied. So when will we hear from the rest of Latin America? There's not much to discuss with regard to the end of democratic rule in Venezuela. Unfortunately, presidents across the region are mired in their own problems or in ideological unity, which makes any real response highly unlikely. Luis Almagro will give it his best shot, I think, but will he meet just stony stares while Venezuela claims this is all a right-wing conspiracy? This morning I arrived to vote early, just after 8:00 am when the lines opened at my local library near UNC Charlotte. The line was already pretty long, and I was tempted to just try some other time, but I had no morning meetings and really just wanted do it. There were several TV news reporters talking to voters. One of them interviewed an older African American woman just a bit ahead of me, who said she hadn't even slept well last night because she was so anxious to vote. Despite the long wait, the mood was very good, with strangers chatting. They just wanted to do this. The line was deceptively long. Even once they confirmed who I was, I had to go wait in a second line to get an open voting machine. All told, I waited two hours. But as I stood there, I kept thinking that voting felt like the equivalent of a shower after watching the three debates. Finally, I got to my machine and started choosing. As readers of this blog will know, I tend toward being both skeptical and cynical about politics, in no small part the result of having studied it intensely for so long. Yet more than I can ever remember I felt like I was doing something important. Then, with the shower comparison in my head, on my way out I ran into Jim Morrill from the Charlotte Observer, who was talking to voters. He asked if I had anything to say about the election. Well, yes. Update: Must be the location. A tweet from just before noon indicated the wait at the library was four hours! I can see the line is quite a bit longer than when I was there. Ecuador announced that it had cut off internet access for Julian Assange, who of course is holed up in that country's embassy in London. This is all kinds of interesting. Here is the official statement. 1. Rafael Correa does not want to have any fingers pointed at him about facilitating interference in the U.S. election. I can't blame him because it is a mess. But he also does not want any future U.S. administration doing a quid pro quo. 2. Wikileaks says John Kerry pressured Ecuador to make this decision. The official statement makes a point of saying the country makes foreign policy decisions on its own, a clearly annoyed reference to this. 3. I don't know what "pressure" there was, but there certainly was communication between the U.S. and Ecuador, and the U.S. got what it wanted. This marks a success of President Obama's overall engagement strategy in Latin America. One of the hallmarks of this strategy is to engage even with countries that at times (or even often) are adversarial. 4. Assange is becoming a headache for Correa, who has not reaped many benefits of his presence. I figure he'd like to kick him out, but the costs of that are even higher. I talked to Steven Taylor today about the aftermath in Colombia, with the general title, "Colombia, What the Hell?" If you don't already know him, he is Professor of Political Science and Dean of the College of Arts & Sciences at Troy University. There's no way at this point to come up with firm conclusions but we do some informed speculation. Who Will Pay Venezuela's Taxes? The Venezuelan government says its new budget (which the legislature is not allowed to touch) marks a radical shift away from oil. He added that 83 percent of the national budget – estimated at over US$830 million – will come from taxes. Another 12 percent will be financed with revenue from socialist state enterprises and only 3.2 percent with oil exports, based on an average of the Venezuelan barrel price of US$30. This is interesting but left me wondering who will be paying these taxes? Inflation is already eating away at wages so income and/or sales tax won't work too well, and there are already plenty of disincentives to invest in Venezuela, so corporate tax won't work too well. Am I missing something? Nicolás Maduro understands perfectly well that representative democracy entails disagreement, debate, and deliberation, all of which he opposes. So he has announced he will submit his budget directly to the Supreme Court and to a group of hand-picked cronies that he will call a "popular assembly." Venezuelan Present Nicolas Maduro will present the country's 2017 budget, with the input of sectors of civil society, directly to the supreme court for approval on Friday, bypassing the national assembly, dominated by a contemptuous right-wing that is not offering any solutions to the country's economic problems. This is, of course, false. The legislature--already illegally stripped of a super majority by that Supreme Court--has offered plenty of solutions. They are just being ignored. For years, elections are what Chavistas hung their hats on. Disagree with us, they argued, but accept that this is what a majority of Venezuelans want. Under Chávez that was mostly true. Under Maduro that has almost never been true. He has ruled primarily by overturning or avoiding election results. At this point, there is almost no pretense at democracy. This week I talked to Jennifer Piscopo, Assistant Professor of Politics at Occidental College and currently a visiting scholar at the Rockefeller Center for Latin American Studies at Harvard. We discussed women and representation in Latin America, especially gender quotas and gender parity, which she's done a lot of research on. It was a great conversation. Ecuadorian President Rafael Correa says that Latin America needs its own regional human rights system, free of the colonial bonds imposed by the United States. And his reasoning is interesting. “Cuando se trata de casos de la oposición se despachan inmediatamente, y cuando son a favor del gobierno no se despachan nunca”, repisó el mandatario ecuatoriano desde la sede de la Unasur en la Mitad del Mundo. In other words, he is complaining about only the opposition gets attention, and the state gets ignored. States have a monopoly of power, and that's why human rights organizations keep such a keen eye on what they do to their own citizens. I wrote about this earlier this year with regard to criticism of NGOs. It all depends on where you sit. During the Cold War, the right complained about human rights organizations, saying they were biased. Now leftist presidents say the same. It is disingenuous for the state to complain about how human rights activists don't side more with the state. People are the victims, not presidents. The Russian government says it is considering reopening a military base in Cuba. Raúl Castro has said nothing about it to my knowledge. I do not think the Cuban government would accept the Russian proposal. I've argued in an op-ed (and will be doing so more in a forthcoming article) that the U.S. opening to Cuba increased U.S. leverage. Once the process got going, Cuba wants it to continue. The United States can reverse it at any time. President Obama has ignored the domestic criticism levied at him for the fact that Cuba did not make concessions for normalization, but he will act if the Russians actually open a base in Cuba. Last night Donald Trump said that if elected, he would appoint a special prosecutor to investigate Hillary Clinton's email scandal, with the goal of putting her in prison. Threatening to put your political opponents in jail is, of course, anti-democratic. It made me think of acrimonious elections in Latin America, none of which included this sort of language. The 2015 Argentine election was nasty, but Mauricio Macri didn't even say he'd put Daniel Scioli or Cristina Fernández in prison (and hasn't since, though his government has frozen her assets). Jimmy Morales did not talk about putting Sandra Torres in jail in Guatemala last year. I don't even remember that happening in the famous 1998 Venezuelan election. Hugo Chávez said he would rewrite the constitution but I don't think he said anything about putting Henrique Salas Romer in prison. Now, in Venezuela the government is in fact putting opposition leaders in prison. And indeed it indicted Henrique Salas Romer in 2014. So Nicolás Maduro has that in common with Trump. At this point, most Latin American democracies seem more mature than the United States. It was just announced that Juan Manuel Santos has won the Nobel Peace Prize. Does this matter? I actually had a former student, who is Colombian and is there, tell me that she had heard a lot of people derisively talking about how Santos had paid more attention to getting the prize than working to convince the Colombian people to vote yes. If you're opposed to the deal, does this statement by the international community matter, or could it possibly even be seen as unwanted pressure? Think too of President Obama's Nobel Prize, which if anything had a negative effect. 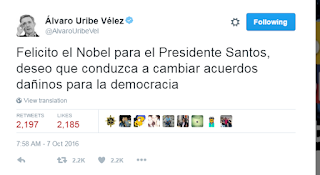 To really make a difference, the prize would have to give Santos leverage over Alvaro Uribe and his followers, which is difficult to see. I would assume the whole thing would be dismissed as a bunch of international leftists who don't understand Colombia's reality. And anyway, would this be enough to convince the "No" voters that the FARC shouldn't just be locked up, which is what they want? Along these lines, I've heard a lot of comparisons to Brexit, which I think is tricky. There was a clear sense in Great Britain that many "Exit" voters regretted their votes and given a second chance would no longer vote that way. I am not getting that impression in Colombia, and I am not sure how a Nobel Prize would change that. Here is Alvaro Uribe's response. That likely will be a common one. Joe Renehen's The Valley (2015) really grabbed me and didn't let go. It is what you might call a "combat mystery" set in remote Afghanistan. Lt. Black is unlucky enough to get chosen to investigate what looks to be a minor infraction in the furthest outpost imaginable. As I read, I thought Apocalypse Now, which of course was based on Heart of Darkness. In the notes after the book, Renehen is asked about Joseph Conrad, which he says shocked him. Hard to understand why. The book makes you feel the situation. Renehan served in Iraq and makes the military lingo sound natural and normal. Young kids are soldiers but barely understand what's going on. Those above them are involved in things they don't even know about. Confusion is constant. The sense of isolation is overwhelming. I really got into the book. My only quibble is the overly mysterious parts of the mystery, where characters talk to each other but we aren't told what they say, where there are knowing glances we aren't allowed to understand, that sort of thing. 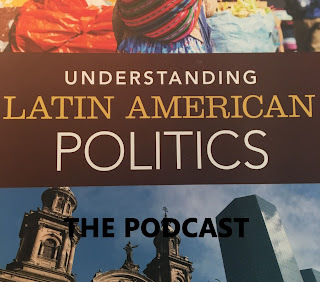 In episode 5 of the podcast, today I talked to Colin Snider, Assistant Professor of History at the University of Texas at Tyler (and also the book review editor for The Latin Americanist, which I realized I forgot to mention) about Brazil. Did the country experience a coup? Can the PT survive this crisis? Was the World Cup a terrible idea or just a bad one? I have a new post over at Latin America Goes Global that among other things compares Daniel Ortega to Richard Nixon. The guiding question is why leaders cheat to win when they don't have to. I am trying to wrap my head around this. Senators Marco Rubio and Mike Lee are accusing the Obama administration of "cultural imperialism" against Latin America, by virtue of its funding for the Organization of American States. Here is the text of the letter. The idea is that by helping to fund the Inter-American Court of Human Rights, the U.S. is forcing a feminist, pro-abortion agenda on countries that don't want it. This is the same Rubio who previously derided the OAS as weak, with countries beholden to Venezuela. Now it is strong and beholden to...well, I don't who he thinks is behind all this. He doesn't even blame Obama for it--just the use of U.S. money. But the "cultural imperialism" is a funny choice of words. It intentionally appropriates the language of the left for a conservative cause. If the OAS lawyers and judges are Latin American, then in fact this isn't cultural imperialism at all, but rather a Latin American debate. And that's what we should encourage. An economist and a physicist ask about the quality of the counting of the ballots in Colombia given how close the election was. Based on research about vote counting, they catalog the ways in which human error could have happened, especially as the counting was occurring quite quickly. In total, therefore, the result presents as many as 400,000 opportunities for classification mistakes. That’s before counting any systematic human behaviours not listed above. This represents a numerical uncertainty that swamps the victory margin of 53,894. Hmm. This raises the question of whether recounts are possible. That does seem to be the case, as votes in a senate race were recounted in 2014. The next question, then, is why have the "yes" supporters not mentioned this as a possibility? I have heard nothing. Check out my latest podcast episode. I talked to Robert Karl, Assistant Professor of History at Princeton University (here's his website and you can also find him on Twitter). I had read his piece at The Monkey Cage from a few days ago, where he provided historical context for the "No" vote, namely suspicion of independent political enclaves in the country. We talked about that and more. The Colombia peace referendum failed by a 50.2%-49.8% margin, with about 54,000 votes out of 13 million making the difference. Collectively we're going to be analyzing this result for years to come, comparing it other other yes/no referenda, etc. One thing I've written about before is how this particular situation is different from other Latin American examples because the FARC is deeply unpopular. Guerrillas in other cases, such as in Guatemala or El Salvador, had a solid base of support and so could reintegrate. As I was discussing with Adam Isacson in my last podcast, the FARC will have a hard time winning any votes. A sizable chunk of Colombians do not even want to give them the chance because of the destruction they've wrought. And there's no domestic constituency the FARC can turn to for support. What's ironic is that the FARC responded to the loss by blaming the "destructive power" of the opposition. The Revolutionary Armed Forces of Colombia - People's Army (FARC-EP) deeply regret that the destructive power of those who sow hatred and rancor have influenced the opinion of the Colombian population. No, not really. The FARC had been spreading hate and rancor for decades, and now is reaping what it sowed. I ran the Novant Health 15K this morning. I am much, much slower than I used to be, even when I was pushing my children (as I did in this same race back in 2008). Back then I was pushing my 6-year old son. Now he's 14 and stayed at home asleep. My comments from those past races is the same for now--this is my favorite time of year for weather and it was a beautiful morning for running, so great for increasing my mileage. My only quibble is the volunteer at mile 6 who was telling everyone "you're almost there" when in fact we still had a 5K to go. Nice sentiment but a bit off!